Airplanes & Rockets website visitor David T. wrote asking about locating an article where the author reports on having initially tried aero-towing by a powered airplane with the tow line connected to the tail of the tow plane. Disaster evidently resulted, so the author ended up connecting the tow line to the wing hold-down bolts and success ensued. This is the only aero-tow article I could find in the 1975 year range that David referenced, but it is not what he was looking for. If you know of an article that contains the experience he requested, please send me an e-mail and I will pass it along to David. Emulate the big boys with a tow to altitude behind a powered job. 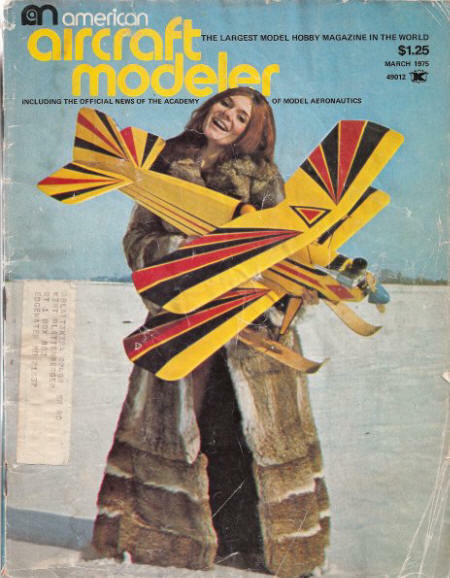 What do you do when you, as a sailplane pilot, have a gallon of fuel and an 88" Buzzard Bombshell-type Model? Being a person who likes to experiment and attempt the seemingly more difficult (and not wanting to waste a gallon of fuel), I decided to press the Bombshell into service in an unusual way. I would combine my first love (sailplanes) with power-a tow plane for sailplanes. I read somewhere. that towing sailplanes was difficult. I think the same person said the bumble-bee cannot fly. That statement may not be fair. We may just be lucky. At any rate, towing as a means of getting a glider to a good altitude is not difficult, providing you have: (a) a good tow plane (slow and stable): (b) a reliable engine (40 cu. in. displacement or larger); (c) a good set of running legs; (d) any sailplane with a towhook near the nose. Let's divide the project into three categories. 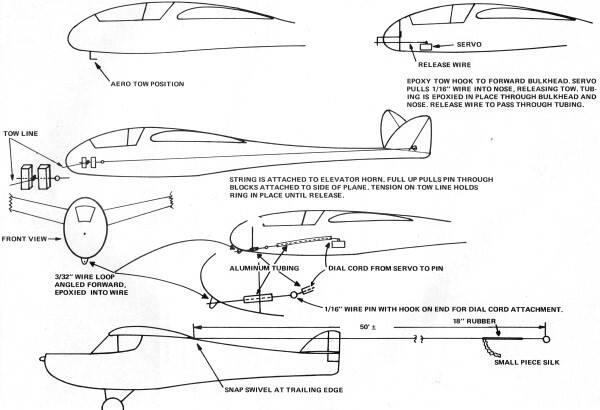 (1) The tow plane, (2) the glider and it's tow release mechanism, and (3) the method of launch and release once airborne. The tow plane: I used an 88" sorta Buzzard Bombshell, powered with a Veco 45, swinging a 13 1/2 x 5 prop. The placement of the towline is immediately behind the trailing edge of the wing. I did not experiment in other positions, as this position worked out perfectly. There is no need to employ any kind of yoke to keep the towline from the rudder and stab, as the glider flies above the tow plane. A simple snap swivel and about 50 ft. of 60 lb. test, monofilament fishing line is used. At the glider end of the line, an 18" piece of 1/8" surgical tubing, with a 12" fishing leader and key chain ring, make up the entire package. Placement of towhook on the glider should be as close to the nose as possible. We have found that a simple hook works fine. See drawings for some mechanical tow releases we have used. The author ROGs the powered tow plane, while the sailplane pilot synchronizes his launch. The drawings on the following page suggest a few of the possible ways to set up the line release. Let the airframe and radio installation be your guide. The external block method is easiest. Method of launch: The tow plane should be revved up to top rpm, then released (ROG is a must). This is where we have experimented in launching methods. We found that someone with good legs (not necessarily the Brigitte Bardot type) holds the sailplane above his head, and runs to keep up with the powered plane as it takes off. The glider will be airborne before the powered plane, and it is during this transition that problems, if any, may occur. 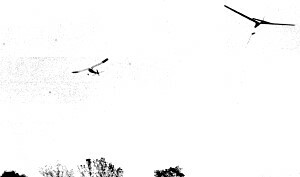 If the line becomes slack, the glider is flying faster than the tow plane and the line may come off the glider. To eliminate this problem, a positive tow release would be helpful. When the power plane reaches the speed of the glider the rubber in the towline helps reduce the jerk (not the pilot) on the glider and tow plane. Try to keep the glider above the tow plane and keep the turns fairly large. When the proper altitude is reached, and this is determined by just how high you wish to go and still see what you are doing, you must release. If you have a mechanical release, use it. If you do not, the tow plane should throttle back and let the glider overfly it. At this point, if there are others who want a tow, you spiral down, land, hook up, and go again. If no one is waiting to go up, chop your engine and see if you can stay up as long as the sailplane. I towed a Cirrus up that got a 15 min. flight ... the Buzzard came down 15 min. after the Cirrus. Overheard the pilot of the glidersay, "That is disgusting." In conclusion, the tow plane must be slow, stable, and have enough power to pull up a 4 lb. plane-minimum .40 cu. in. It is best to have a positive release towhook. With any kind of luck, the glider guys will pay for your fuel. One word of caution. When the tow plane is landing, be careful of the towline. It might smart if you got hit by the tow ring at 20 mph. Barry Killick displays the automatic tow release in his Windsong.